I absolutely love this wash bag. We are going on an extended holiday and I have tried out the regular scrubba bag as well as this one. They both impressed me. I have been using the Allurette for a few weeks now to wash my delicates and it has done really well. It beats using a sink to wash clothes in as I have sensitive skin so I know what soap has been used in the bag—no bleaches or harsh chemicals that are used to clean hotel sinks. I haven’t used the towels yet but I’m sure they will do the job while on holiday. Great product. Grab an Allurette washer and 2 Allurette towels at a great price. The Allurette washer is perfect for gently and effectively washing delicate clothing and activewear, while the 2 Allurette towels make the drying process faster. Save time: Small loads can be washed in the Allurette washer in just a few minutes. No more messy soaking or waiting for the washing machine, which is often too harsh on clothes anyway. 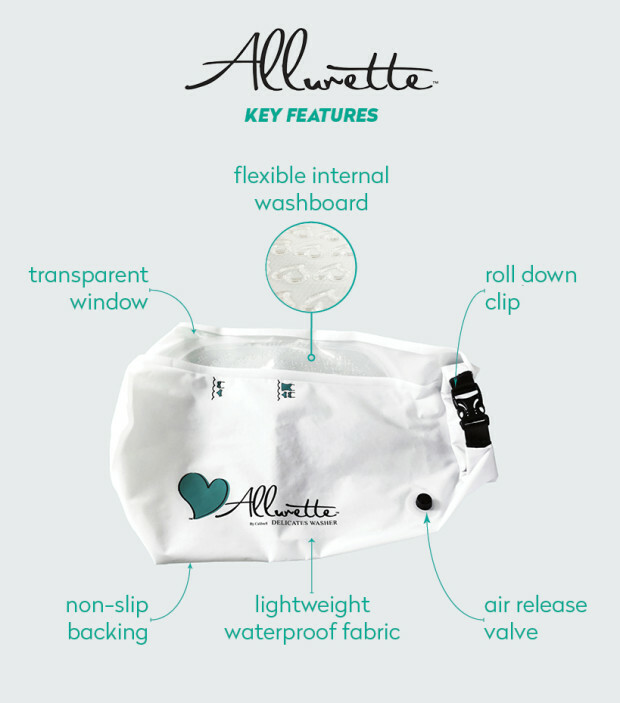 The Allurette towels mean your clothing will dry much faster by absorbing wetness from the clothing. Avoid mess: The Allurette washer is self-contained, preventing you from having to mop up any soapy spills - ideal for anyone who avoids hand washing because the clean-up takes longer than the washing process itself. The Allurette washer can also be compactly stored after use. Dry your clothes faster: Simply place the Allurette gentle towel on a flat surface with your wet clothes on top, then fold the towel over your garments and carefully press together. The towel’s highly absorbent microfiber material will quickly remove a large quantity of moisture from your clothes, reducing the overall amount of time required to dry them. We recommend pressing each item individually to achieve the best results. 64 cm x 80 cm when laid flat. Allurette washer and 2 towel combo has been added to your cart!